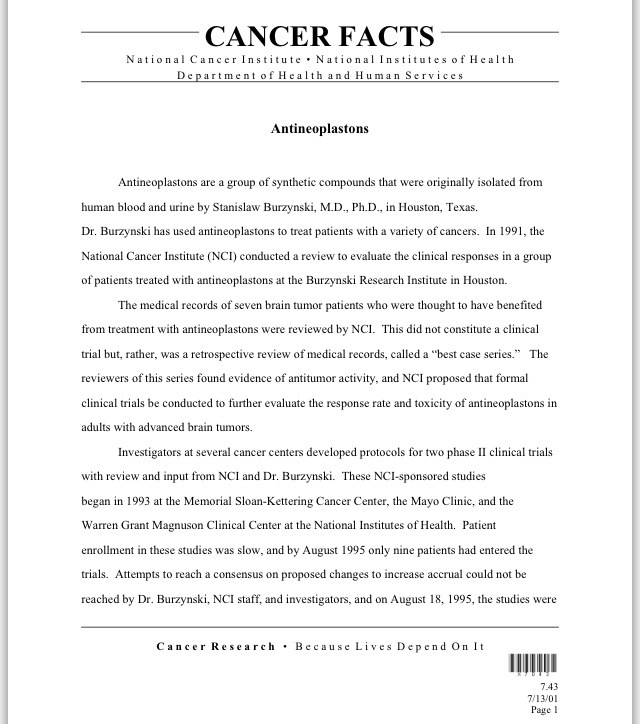 This entry was posted in CancerNet, critique, critiques, critiqued, critiquing, Memorial Sloan-Kettering Cancer Center (MSKCC), National Cancer Institute (NCI), National Institutes of Health (NIH), Stanislaw Rajmund Burzynski and tagged "(3) makes or uses any false writing or document knowing the same to contain any materially false fictitious or fraudulent statement or entry”, "adult patients with refractory brain tumors", "adults with advanced brain tumors", "alternative medicine community", "best case series", "brain tumor patients", "Cancernet “fact sheet”, "clinical experience", "clinical investigators", "clinical responses", "Critiquing: Dr. Michael A. Friedman Dr. Mario Sznol Robert B. Lanman Memorial Sloan-Kettering Cancer Center Mayo Clinic Department of Health & Human Services (HHS) Public Health Service Quality A, "Critiquing: National Cancer Institute (NCI) at the National Institutes of Health (NIH) CancerNet fact sheet”, "Decision Network", "Department of Health &Human Services (HHS) Public Health Service", "Dr. Burzynski", "Dr. Richard Klausner", "Dr. Stanislaw Burzynski", "evidence of antitumor activity", "fact sheet", "formal clinical trial", "Health Department of Health and Human Services", "human blood", "inhibit cancer cell growth", "low performance scores", "Mayo Clinic Proceedings 1999 74:137–145", "Mayo Clinic", "medical records", "Memorial Sloan-Kettering Cancer Center", "Michael Hawkins M.D. leader of the site visit team", "Michael J. Hawkins, "Michael J. Hawkins M.D. Chief Investigational Drug Branch", "Michael J. Hawkins M.D. 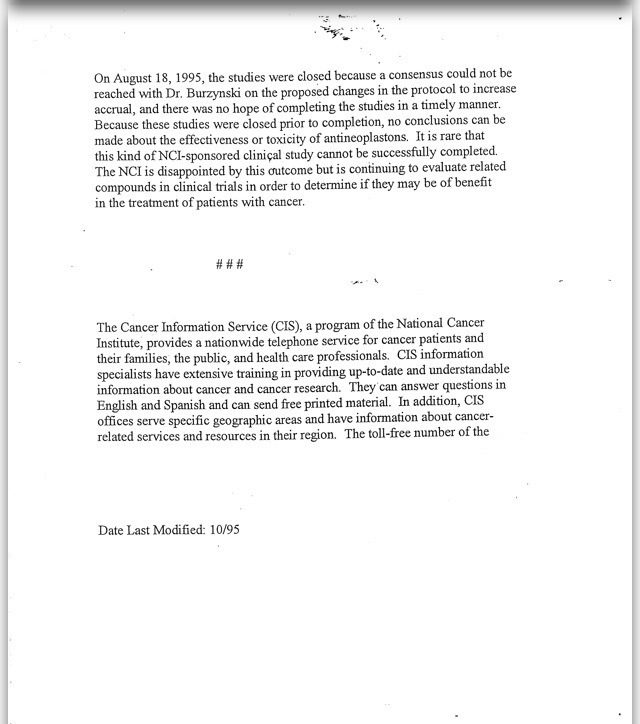 ", "minutes of Decision Network committee meeting", "National Institutes of Health (NIH)", "National Institutes of Health’s (NIH) Office of Alternative Medicine", "NCI Decision Network Report on Antineoplastons", "NCI reviewers", "NCI scientists", "NCI staff", "NCI-sponsored clinical study", "NCI-sponsored studies", "NIH Clinical Center", "Phase II Study of Antineoplastons A10 (NSC 648539) and AS2-1 (NSC 620261) in Patients With Recurrent Glioma", "phase II trials", "presumed to know the law”, "presumptive evidence of antitumor activity", "response rate", "retrospective review of medical records", "Richard Klausner M.D. 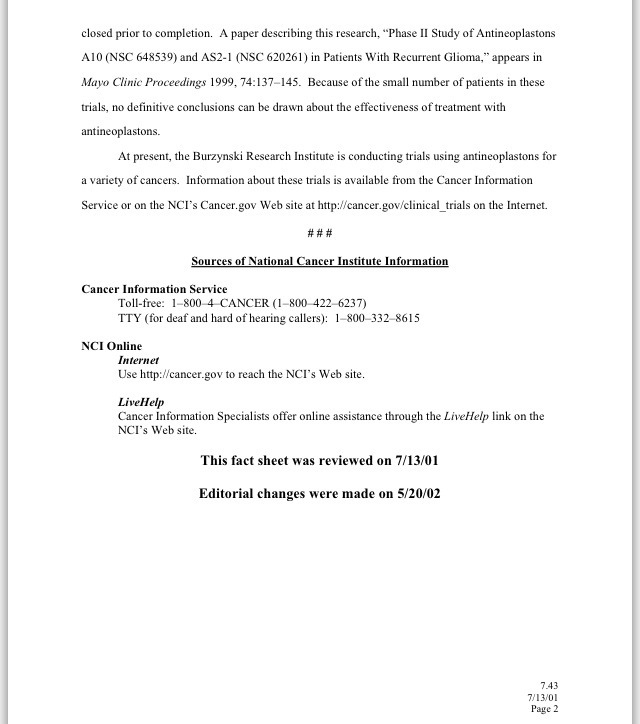 Director National Cancer Institute (NCI) National Institutes of Health (NIH)", "Richard Klausner M.D. Director", "seven brain tumor patients", "spinal cord metastases", "Stanislaw Burzynski M.D. 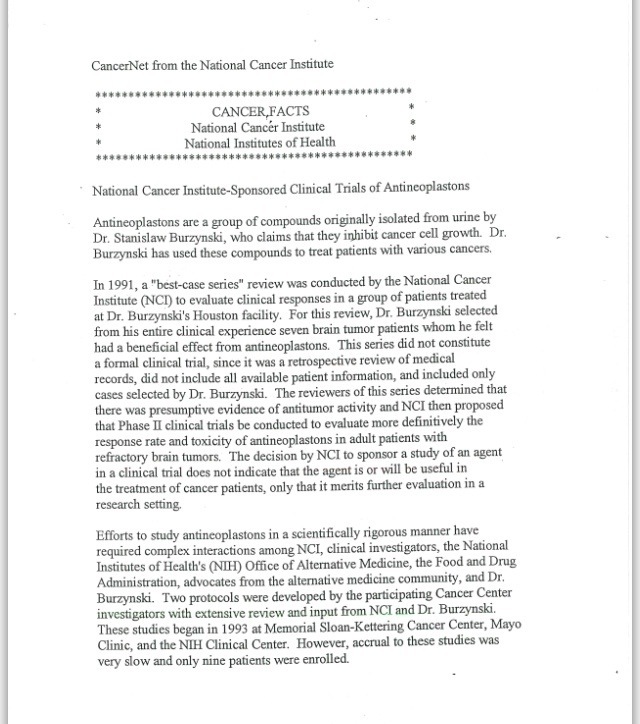 Ph.D.", "Statements or entries generally", "synthetic compounds", "The National Cancer Institute (NCI) at the National Institutes of Health (NIH) issued its CancerNet “fact sheet”, "Title 18 Part I Chapter 47 § 1001", "Warren Grant Magnuson Clinical Center at the National Institutes of Health", Americans, antineoplaston, antineoplastons, “all available patient information.”, “factual issues”, “Seven patient cases were presented at the site visit and the records, “The site visit team determined that antitumor activity was documented in the best case series", Burzynski Research Institute, Cancer, Cancernet, cancers, Clinical Trials, consensus, Food and Drug Administration, http://www.emory.edu/KomenEd/PDF/Treatment/Antineoplastons.pdf, http://www.law.cornell.edu/uscode/text/18/1001, https://stanislawrajmundburzynski.wordpress.com/2013/09/08/critiquing-stanislaw-burzynski-on-the-arrogance-of-ignorance-about-cancer-and-targeted-therapies/, https://stanislawrajmundburzynski.wordpress.com/2013/09/17/5-1991-11151991-dr-michael-j-hawkins-to-decision-network/, https://stanislawrajmundburzynski.wordpress.com/2013/09/17/6-1991-12291-nci-decision-network-report-on-antineoplastons/, https://stanislawrajmundburzynski.wordpress.com/2013/09/18/24-1995-10271995-burzynski-to-dr-richard-klausner-7-pgs/, investigators, Memorandum, MSKCC, National Cancer Institute, National Cancer Institute (NCI), National Institutes of Health, NCI, NIH, pathology slides and scans documenting response were reviewed”, phase II clinical trials, protocol, retrospective, sponsor, toxicity, tumors, urine by didymusjudasthomas. Bookmark the permalink.